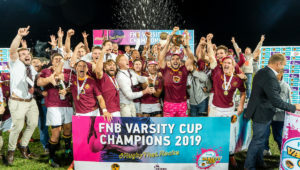 In a performance that underlined why they are defending champions, Maties were dominant throughout much of the match, starving UCT of any quality possession while taking control of the territory on a windy evening at the Green Mile. 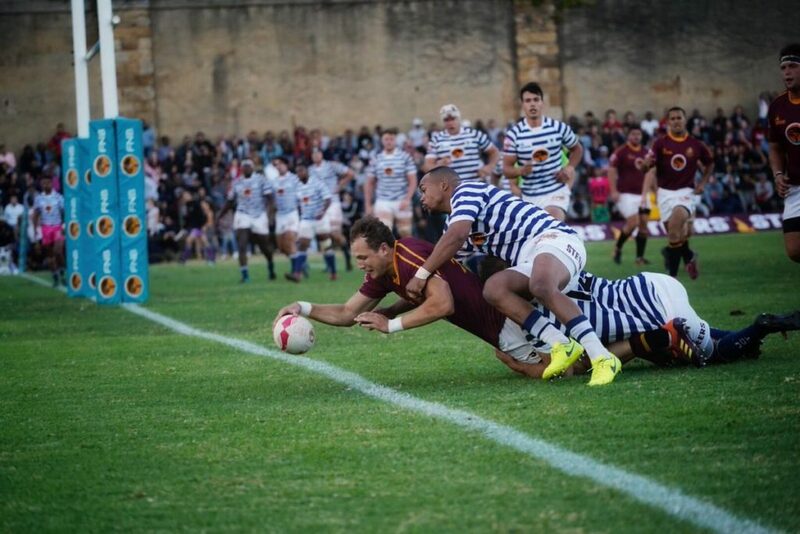 Star centre Chris Smit showed why he is one of the players to watch this season as he popped up everywhere for Maties and created their third try with a wonderful offload. Young flyhalf Jordan Chait was also in impressive form as he looks more and more comfortable since taking the No 10 jersey from former Matie Chris Smith. Having been on the end of a 33-14 loss in Stellenbosch last season, the Ikey Tigers, bolstered by Western Province loosehead Michael Kumbirai, were up for revenge. It was the visitors, however, who saw all the early possession, created plenty of pressure and won numerous penalties. This eventually saw UCT suffer an early blow when captain Josh Moon was sent to the sin bin for repeated infringements. Some excellent last-ditch defending saw UCT survive a number of close calls near their tryline. The dam wall eventually burst when the hosts ran out of defenders and speedster Duncan Saal scurried over out wide. It was minutes later that another good run from Saal took the Maroon Machine close to Ikeys’ line. Some good hands from the backs then saw Smit bash over. The hosts needed a big talk at the strategy break, and while they came out with a bit more intent in the tackle, they found themselves even further behind when Maties No 8 Stephan Streicher produced a moment of brilliance, throwing a dummy and running a good 40m to score in the corner. Ikeys finally gave their fans something to shout about after winning a 5m scrum, when No 8 Nyasha Tarusenga powered over the line, taking a number of Maties tacklers with him. 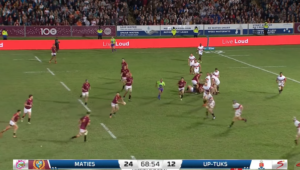 Maties picked up where they left off, as minutes into the second half, Cornel Smit got on the end of an offload from fullback Edwill van der Merwe and fell over the line for the bonus-point try, and his second of the evening. 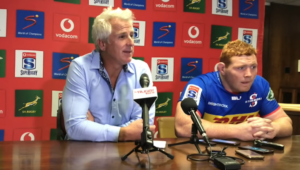 The visitors were not done though, as a flowing backline move allowed Van der Merwe to dot down near the corner, before captain Johan Momsen drove over from close range for their sixth try. 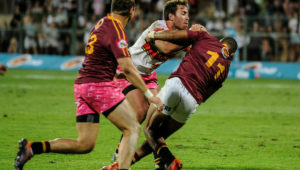 Maties were at their counter-attacking best in the final quarter of the match as they suffocated the Ikey Tigers and added tries through substitute back Reinhardt Fortuin, which all but ended the match as a contest, as well as lock Sesink-Clee Jordan, flank Johann van Niekerk and Cornel Smit, who rounded off his hat-trick. UCT – Try: Nyasha Tarusenga. 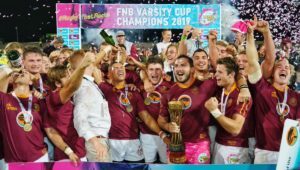 Maties – Tries: Duncan Saal, Cornel Smit (3), Stephan Streicher, Edwill van der Merwe, Johan Momsen, Reinhardt Fortuin, Sesink-Clee Jordan, Johann van Niekerk. Conversion: Jordan Chait (2), Fortuin (5). UCT – 15 Darian Hock, 14 Rayno Mapoe, 13 Sibabalwe Mzanywa, 12 Robert Ball, 11 Thobekani Buthelezi, 10 Michael Brink, 9 Stefano de Gouveia, 8 Nyasha Tarusenga, 7 Josh Moon (c), 6 Cornelius Otto, 5 David Meihuizen, 4 Duncan Saffy, 3 Michael Kumbirai, 2 Cuan Hablutzel, 1 Ashwyn Adams.